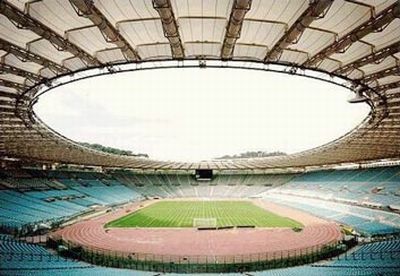 As expected it wasn’t an easy match in San Paolo stadium of Napoli that was filled with 60.000 fans, from which 1.000 with a red and blue hart. As usual in matches between Napoli and Genoa the atmosphere was very friendly between the fans. Unless the fact the suspension of Bocchetti was over, Genoa started the match with the same 3 experienced defenders as last week: Biava, Dainelli and Moretti. Ivan Juric had some little problems just before the match, so he was substituted by Sokratis. 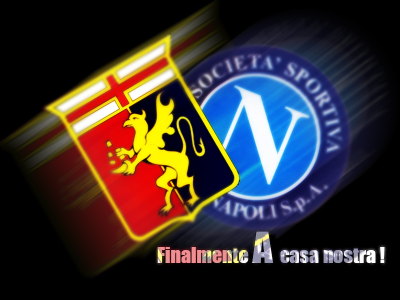 It was unusual to see that not our Gasperini-boys but the opponent Napoli was the most offensive team in the field. 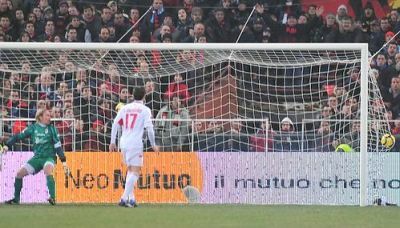 Genoa was saved by the post when Dainelli almost scored in his own goal and just before halftime by the crossbar (shot of Cannavaro). The only remarkeble goal-attempt of Genoa in the first half was a shot of Criscito that was saved by Napoli’s goalkeeper De Sanctis. Halftime: 0-0. In the 2nd half Napoli became stronger and stronger, just as the rain, but our defense played very good. At the time the Napoli strikers finally broke through our defense our goalkeeper Amelia reacted fantastic. In the 56th minute our new striker since friday: Robert Acquafresca made his debut in our red and blue shirt, but also he could not change the score: 0-0. With the transfer of Diego Milito to Inter last summer Genoa already became the owner of one of the biggest talents of Italy: Robert Acquafresca. Because of his young age and the fact Genoa already had the central-forwards Floccari and Crespo in the selection, Acquafresca was rent to Atalanta Bergamo, the former team of Sergio Floccari. Now 5 months later Floccari is rent to Lazio, Hernan Crespo is sold to his first love in Italy: Parma and besides Acquafresca Genoa also hired David Suazo of Inter and bought the very talented striker Aleksich (18) of Vojvodina Novisad. So far this transferperiod Genoa also bought Dario Dainelli (Fiorentina) and the yougsters Matteo Chinellato (also Fiorentina) and Alberto Frison (Vicenza). Besides Floccari and Crespo our President also hired out Andrea Esposito (Livorno), Francesco Modesto (Bologna) and goalkeeper Danilo Russo (Vicenza). 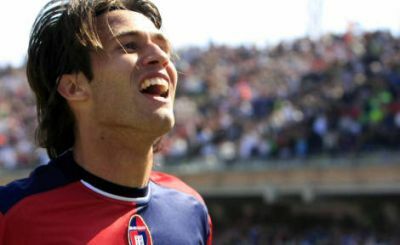 Yesterday 2 Argentinian goals of Palacio and Crespo gave Genoa a 2-0 victory against Atalanta. Our red and blue boys are now on the 8th postion in the standings with 31 points in 21 matches, 6 points less then last year after 21 games. Genoa started the match with the experienced defenders: Biava, Dainelli and Moretti. Unless the suspension of Bocchetti we did not take a goal, so the 3 “oldies” did their jobs well, unless the fact all 3 got a yellow card of referee Giannoccaro. After 18 minutes our returned wingstriker Rodrigo Palacio scored the openinggoal after a fantastic assist of Zapater: 1-0. Also after the goal Genoa was the best team in the field, which was completely clear when Crespo headed the 2nd goal behind goalkeeper Coppola in the 42nd minute. With 2-0 the halftime whistle arrived. In the 2nd half the Gasperini-boys let Atalanta play in midfield, but Genoa always controlled the match. The referee also saved Atalanta serveral times to close an eye at the moment one of the Lombardian players with a yellow card made another big foul. In the last minutes Crespo was substituted by Suazo who created himself 3 big chances to score his first goal in Luigi Ferraris, but Coppola (twice) and the post stopped him. 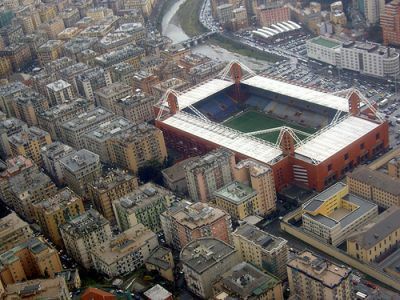 Next Saturdaynight Genoa plays in Naples against the reborn hometeam. Unless the fact that our goalkeeper Marco Amelia could play cards because he had almost nothing to do tonight we only draw against Bari: 1-1. Our goal was scored by Omar Milanetto in the 52 minute. The match started completely wrong. After the 3-0 defeat in Rome, Genoa needed some trust but after only 5 minutes Bari scored a very dubious goal because of off-side and a handball of Barreto. Now after the match we can say that this was the only time Bari was close to our goal, but at that moment it was a little shock to all Genoani. After Milanetto first missed a big chance eye to eye with goalkeeper Gillet, in the 52nd minute Genoa got a free-kick just outside the penalty-area. Omar “Hannibal” Milanetto tried to shoot the ball over the wall in the near corner, but Almiron touched the ball and it went in the far corner: 1-1. Several times Genoa was close to the second goal and Juric hit the post with another free-kick, but despite the fact the cornerscore was 12-0 it lasted 1-1. Genoa is now 11th in the standings with 28 points in 20 matches. The feeling before the match was good, unless the fact that Genoa missed 3 of the 4 wingstrikers with Jankovic, Palladino and Palacio. Only Giuseppe Sculli was able to play, but also he had to leave the pitch with an injury after only 30 minutes. At that moment Roma already took te lead by a goal of Perrotta in the 16th minute. When Mesto missed a great chance to score the equalizer and Luca Toni scored the 2nd goal of Roma the match was over, while there were still 45 minutes to play. In the 2nd half Luca Toni also scored his second goal and Sculli’s substitute Ivan Fatic missed a great chance eye to eye with the goalkeeper of Roma, so we lost 3-0. We only have to wait till Wednesday to have the chance for a revanche against Bari that draw against Inter this weekend: 2-2. Genoa is out of the Coppa Italia. Our red and blue boys lost 1-2 against Catania, the same team we beat last Sunday by 2-0 in Serie A. The biggest differences between the 2 matches: this time Genoa played with 6 substitutes and referee Velotto. 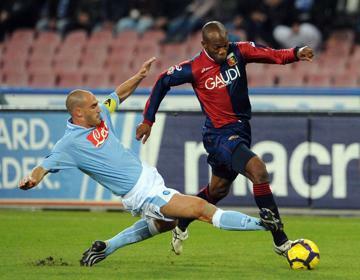 After Catania took the lead by 0-2 (2 goals of Plasmati) in the first 7 minutes it was Genoa that made the match. In the 56th minute Marco Rossi scored 1-2 and all 7.600 fans in the stadium waited (and hoped) for the equalizer. Only referee Velotto did not want that Genoa would return in the match, because in the 58th minute he gave a red card to both Sokratis and Marco Rossi (Captain of Genoa who protested against the red card of Sokratis) so Genoa had to end the match with 9 players. Believe it or not, also with only 9 players Genoa was close to the deserved equalizer when Hernan Crespo’s shot touched the post in the 89th minute. The 9 players of Genoa did fight like lions, but it did not succeed: 1-2 and Catania plays in the quarter finals against A.S. Roma, our opponent of next Sunday. After the match, also some happy news. Experienced defender Dario Dainelli was presented to the press. 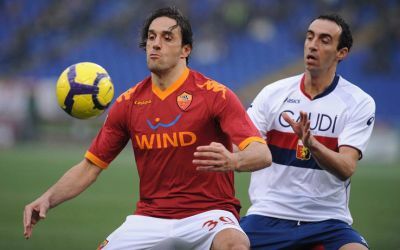 Sunday he plays his first match with Genoa against his old Fiorentina-friend Luca Toni, the new striker of A.S. Roma.